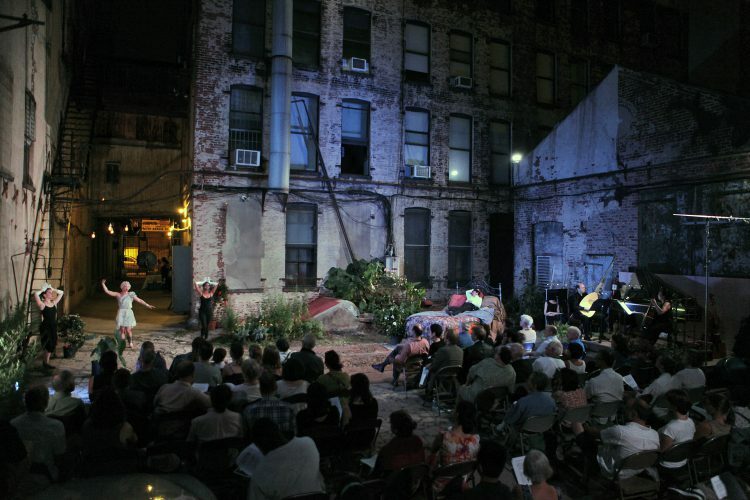 A pioneer of the alternative opera movement in New York City since 1998, Vertical Player a creates ensemble-driven opera theatre in extraordinary venues. Our work, nurtured in our Brooklyn storefront, has extended to the Brooklyn working waterfront, the deck of an oil tanker, a raw midtown manufacturing space, the Brooklyn Bridge Park, a factory courtyard on the Gowanus Canal, and outdoors on the street, all with the same basic imperative: to share our creative process with people from all walks of life. Vertical Player Repertory’s mission is to bring high quality opera theatre to people of a world deeply in need of idealism, meaning, and beauty. We revive rarely-performed, significant operas spanning the 17th to the 21st centuries, we bring fresh theatrical vision to well-known operas, and we promote and develop new opera. We invite artists from all disciplines to create in a collaborative, warm environment. We bring seasoned professionals, aspiring young artists, and members of the community together to learn from each other. VPR works to develop productions that build a community of imaginative thinkers on both sides of the stage. We bring theatrical integrity and an unconventional spirit to an eclectic mix of repertoire, inviting performer and audience alike to re-imagine the possibilities of opera.